Sam Neumann from Breeding Leadership 2016, with her father, Neil. AUSTRALIAN Wool Innovation is calling for applicants for its 2018 Breeding Leadership course. AWI said developing the leadership skills of young people in the wool industry is a key feature of its investment in education and training. 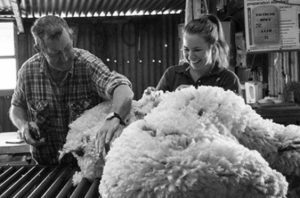 The Breeding Leadership course is an opportunity available to any wool industry participants aged from 25 to 35 years. More than 130 men and women have completed the week-long Breeding Leadership course in alternate years since 2002. The course is an opportunity to learn and network with like-minded people from around Australia, AWI said, and is open to anyone currently working in agriculture with a focus on the wool industry. Participants will learn from skilled deliverers in the areas of leadership and personal development, working in teams, strategy and ‘thinking big’ about the future, as well as covering business fundamentals, such as managing change, entrepreneurship and innovation and problem solving. The program provides local industry links and opportunities for business visits, both on-farm and off. Victorian participant in the 2016 course Becky Mackay said Breeding Leadership was invaluable for gaining knowledge from industry leaders and boosted her enthusiasm towards the longevity and stability of the wool and sheep industry. Sam Neumann from South Australia also participated in Breeding Leadership 2016 and said the course allowed participants to look at topics vital to business but outside their usual operating scope. AWI manager, wool grower education & capacity building, Emily King, said this is a very rewarding program for anyone working in the wool supply chain or service industries. The course will be delivered in February 2018 in Clare, South Australia by Rural Directions Pty Ltd, an agribusiness consulting company. Applications to participate in the program are now open, with submission due by Monday, October 16 2017. Interested individuals are encouraged to visit wool.com/breedingleadership or contact Carlyn Sherriff via phone 08 8841 4500 or email csherriff@ruraldirections.com.